duster into high duster. High-pile sleeves reach into crevices effectively. longer life. Promotes green cleaning. May contribute to LEED certification. dusting. Microfiber sleeves can be used damp or dry. Machine washable. of disposable products and require fewer chemicals. 30-in. length. total recovered material. Fits most mop heads. 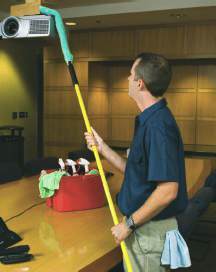 Flat duster for tight, narrow spaces.